How to remove residue from the cooktop Electric Range (NE58K9500SG)? Use only a ceramic cooktop cleaner. Other creams may not be as effective. By following these steps, you can maintain and protect the surface of your glass cooktop. 2. Spread a few drops of ceramic cooktop cleaner on the entire burned residue area. You can also spread a few drops on the cleaning pad. 3. Using the cleaning pad for ceramic cooktops, rub the residue area, applying pressure as needed. 4. If any residue remains, repeat the steps listed above as needed. 5. For additional protection, after all residue has been removed, polish the entire surface with ceramic cooktop cleaner and a paper towel. 2. Use a single-edge razor-blade scraper at approximately a 45° angle against the glass surface and scrape the soil. It will be necessary to apply pressure to remove the residue. Note: Do not scrape the seal. 3. After scraping with the razor scraper, spread a few drops of ceramic cooktop cleaner on the entire burned residue area. Use the cleaning pad to remove any remaining residue. 4. 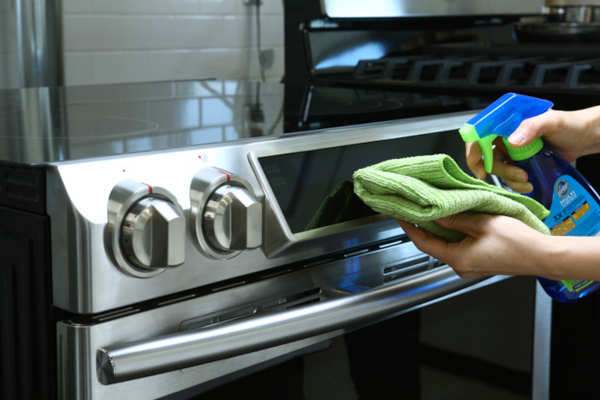 For additional protection, after all residue has been removed, polish the entire surface with the cooktop cleaner and a paper towel. To clean the seal around the edges of the glass, lay a wet cloth on it for a few minutes, then wipe clean with a nonabrasive cleaner.